Those of you who are involved in electrical works are well aware of some of the undesirable traits that come with a traditional toolbelt. Well, say goodbye to all of that. We have prepared a list of the best tool belt for electricians while keeping the quality and comfort in mind. One of the essential tools that you want to invest in is a proper tool belt. Though the choice of a tool belt might not seem very significant to the beginners but try asking someone with experience, then you'll know why you need them. So, here are our choices for the best electrician’s tool belts. This is without a doubt one of the best electrician’s tool belts. The best thing about it is, it distributes the weight around your body evenly. Its design allows it to stick to the body rather hang from it. You will not have any strain on your lower back and hips. These specially designed suspenders let you carry a heavy load for a long time. The belt is very comfortable with 3’’ wide padded comfort belt. It also comes with a double-tongue roller buckle. If you have used these kinds of buckles, then you know that they have a tendency to pinch on your waist. CLC solves this problem with the polyester fabric and ballistic binding and a thick pad. The belt will fit in almost any waist size ranging 29’’-46’’. If you are not in this range, I would advise you to buy a weight machine first. It has a zipped top flap pouch on its side to prevent the spillage of your tools. It will organize them with such beauty that you will not even need to look at the pouch, even when you are working with small tools. Along with a large set of pockets, you will also have tape strap, tool snap, and a metal hammer holder. The weight distribution is very good. You will not feel like things flapping out like you do with most other belts. Huge storage, you can even keep your phone there. Though there is plenty of tool pockets, the hardware pockets could have been more. It is not a big deal, but I would like to point out that the safety of the drills could have been more. DEWALT has kept their promise of guaranteed toughness by creating this small tool pouch. It is small, easy to carry and very cheap. It has a sturdy construction. It has lots of pockets. The large main pockets are in the back and the smaller pockets are in the front. Though it doesn’t have any specific place for the drill, it has everything else you can ask for. You can buy DEWALT leather craft 5021 impact driver holsters for your drill and drill bits. You will not feel uncomfortable with it. Yes, it will put all the weight on just one side but if you are not a professional then you don’t need more than this. And if you are a professional then you will probably have more bags than this as it can be a part of a modular set. You can clip it to your back pocket or attach it to a belt up to 2-3/4-inch wide. You will have pockets to hold all your small as well as large tool﻿s. Web loops and sleeve pockets will allow you to carry tapes and other small instruments. There is a handy flashlight holder which you can use for other purposes as well. The carabineer for keys adds a fine finishing touch to this compact bag. It is easy to move around with it. Cheap relative to other bags of its quality. If you are only working with this single bag, it will put all the pressure on the same side but you then again, you can just switch sides as it is very easy with the rear clips. Tradegear has put a lot of effort in this belt. It is prevalent in its design. This belt might be the most heavy-duty belt you will find on the market. It is comfortable, well-padded and durable. It has suspenders. It has pockets for all kinds of tools. Weight distribution is great. And, its jeans look is what makes you feel like a real gunslinger. The pads are made of memory foam. They are breathable too. It has a ventilating design for which you will not sweat under the pads. It is equipped with 27 pockets of different sizes for different tools in its 2 bags. The famous bar-tack stitching. The box design is reinforced with that. Strong metal rivets were also used. The pocket opening has 250 deniers Duratek fabric. The high-density nylon around it makes the bag very strong and tough. A unique feature of this bag is its handles. It helps you to carry it and take it on and off. You have four sizes of this belt. The sizes range from 26” to 55”. Crazy, right? The bags, loops and other parts of the belt are very well stitched. The follow-up services are very good. It’s a nice gift for a man. I know everything about this belt seems overwhelming but, a strange anomaly I spotted is the Velcro. It seems to lose its grip over time. But the positive sides are too many to put the focus on this tiny issue. The CLC custom 1528 tool bag is a box-shaped tool carrier. There are two sizes of this model. It has 22 pockets. 14 of them are outside the bag which you can use for many kinds of tools. And 8 are inside. These are obviously larger pockets where you can store all your big tools like drills and large screwdrivers. Moreover, there are several elastic loops to help you out with your tools that are tall. This is one of the best small tool pouches available on the market. CLC equipped this bag with 3 large main pockets and 3 smaller pockets. With these smaller pockets, you will be able to manage the smaller tools which are relatively hard to organize. It also has 6 large screwdriver holders which can also be used for keeping flashlights, batteries, testers and many other similar tools. It has 4 internal tool loops too. The metal chain hanging on the right side of the bag looks very stylish. It can hold all of your electrical tapes. It also has tool snaps and metal clips to hold on to all sizes of measuring tape. It is made of double layer of rugged, ballistic polyester fabric. It makes the bag very strong and durable. The bag is very comfortable and good looking too. You can get it in three sizes. One with 12 pockets and the other two consists of 20 and 21 pockets. You can choose the one you need. This is perfect stuff for the people who don’t like to use belts. You can carry it and even hang it from its handle while working. It makes me feel good when I hear from a brand, “If it is not better, we don’t make it”. And they are not kidding. You will feel the hard work and the effort they put into designing and presenting a product even before you have the product in your hand. Everything is top notch here. There is a place for your phone, keys, drills, knobs, screws, and knives. You will go bonkers counting the pockets. It has an extra-long tape chain. The belt will be fit for an adult. You can clip it to your regular belt or your tool belt. You can carry it around and make it stand on its own. Electricians, farmers, carpenters, plumbers, contractors everyone can use it. 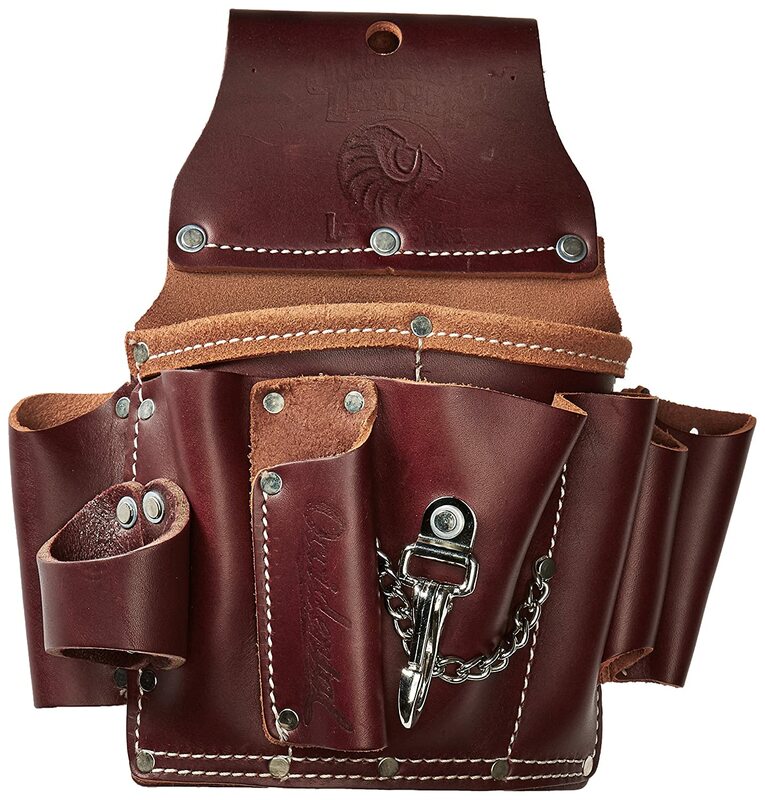 You can have suspenders holster, pouches, belts, bags almost everything with it. It is fully customizable as per your need. And all of it without sacrificing the quality of the materials. It has a rugged 6 layers of construction. The best part is, it stands. The clips work very well and good for tough conditions like its name. The warranty and service are very good. You might feel the pockets to be a little deep. The clasp might also feel hard to open like as it is breaking. But they will not. They are just too strong. CLC never misses to surprise us. This time they have a small compact tool carrier which can hold almost anything you can ask for. The thing I love about this bag is the multi-compartment plastic tray. It just appeases my heart when I see that. No more struggling with the small bits of my tools. No more pulling threads damaging the inside. This is without a doubt the best part of this bag. This bag is very comfortable to carry thanks to its extra padded carrying handle and adjustable shoulder strap. Another unique feature. This bag makes packing the most efficient. This has the best arrangement of accessories. It is durable and can be used in any conditions. As much as I love the plastic tray I also loved the side pockets the previous design had. But, the pockets had to be sacrificed for the tray. The strap clips could have been better too. The 5719 powerline series electrician tool pouch reflects the 160 years of experience of Klein Tools. With all those experience, they sure have an advantage in the market. So, let’s see if they have lived up to our expectations. It is made with double layered 1000 denier DuPont Cordura Plus nylon. It makes it very strong and gives a strong lift to its durability. It is also a light leather pouch. Klein is not wrong when it says that it has a strong abrasion, punctures, and tears. To increase the strength, it is stitched with double nylon and riveted. The small side pockets host screwdrivers, needle nose pliers, pencils, markers whatever you want. These pockets have a lot of space. Good enough to carry a tab or a water bottle. You can use the smaller pouches to carry small instrument. You can use it all year around in any conditions. It has a reinforced bottom for extra caring capacity. It is very light and comfortable to carry around. The pouches are sized perfectly. This is well designed to company an electrician. I have experienced blowing out of the bottom of the pocket. And sometimes the pockets are not tight enough. But these are negligible facts. The custom leathercraft 1503 is one of the best creation of CLC. This time they offer 7 designs for this particular bag. One also has a zip top pocket. It has a 600d polyester construction. So, you can guess how strong it will be. You can easily hold on to that for years. At the same time, it is also very light making it easy to carry. You can attach the bag to a regular belt or a tool belt. It has clips in its rear to latch on to your belt. The clips are heavy duty. You can even attach it to other modular set or add it to your previous set. It will go with almost anything. It has 3 internal pocket sleeves and 6 external pockets. Here you can organize anything from a screwdriver to a flashlight. It has detachable electrical tape sling. The main large pocket is 4” deep and 5” wide. There is also a snap o the top. It is very light and strong. The pockets are perfectly sized. The snap on the top is a nice touch. You don’t have to fight the flap every time you are reaching the tools. This bag doesn’t stand upright on its own. And there are lots of loose threads within the large pocket. Anyone can accidentally pull it and damage the pocket. Occidental Leather is known for their extra thick, water-repellent leather tool systems. Their experience and design are something that will always motivate you to acquire one of their creations. The Occidental leather 5500 is an all leather electrician’s tool pouch. It has 15 pockets. The tool holders are placed in the front and in the sleeves. You can put your most necessary tools there. There is also a loop on the left side for flashlights. To hold the tapes, there is a metal chain. You will also have a hammer holder. There is also pockets for small tools. With this system, you will always get everything nice and clean. It is designed to put less pressure on your hips. If you carry a ton of tools then you might feel something but otherwise, it is as smooth as butter. While wearing the pouch you can still wear an apron or anything in front. You will love the way it adjusts with your hip and legs. This is a strong and durable pouch. The stitches have a fine finishing. You will not find any loose threads. Everything is neat and clean. The rivets have very small distances giving the pouch a sturdy construction. The leather quality is very good. The pockets are well built. You don’t have to worry about tools falling everywhere. It provides you more control over your tools. Good for daily professional use. The visibility is quite less. It is because of the dark hue of the leather. But if you want a good material like this you need to sacrifice something. Arsenal 5548 is another creation of Ergodyne. They designed it, especially for electricians. You can also have an 11 pocket and a 16 pocket bag. It is made up of 1680D ballistic polyester. It makes it strong and sturdy. It has 2 large main pockets in the back and 5 smaller pockets for smaller tools in front. 6 screwdriver slots are designed to hold screws of different types and sizes. There are a tape measuring clip and nickel-plated hardware. These can store all kinds of tapes. It is easy to carry. It adjusts to your lap. You don’t want to fight your pouch while working. It has just enough space that an electrician needs. Not more not less. There are enough pouches to fit everything for any expeditions. But, for everyday use, you might need some other bags or small pouches as well. But that will not be much. You can get this in three colors, grey, black and Carhartt brown. If you are working in watery conditions or in the dirt, this is the thing for you. The breathability included on the bottom is awesome. Pockets are not too deep. Just the right size. Large screwdriver sleeves on each side. It will not stand on its own. But you can always modify it. But the big disappointment is that it doesn’t hold a hammer. CLC this time offers a leather and steel mix heavy-duty tool bag. It is durable and strong and organizes your tools in the best way possible. Its box-shaped design allows it to store and carry more tools. The shape also permits to have more pockets on the front, rear and on the sleeves. The large mid-section of the carrier is divided into three parts for more efficient storage. The handle is also leather. The handles are attached to the main body with steel connectors. The stitches and the rivets make the bag more strong and sturdy than ever. It defines what we call heavy-duty. You will not have to look for any other bag anytime soon. The square box has 8” of side and a high of 15”. Yes, I know it’s pretty tall but the design of the inside of the bag will not let your tools to fall and roll around in your bag. You can get it in three colors tan, black, Carhartt brown. The build quality and the materials used are of top class. The storage is better than most of its competitors. The size and the square shape makes the tools firm and tight. The thing I miss the most here is a shoulder strap. But if you be a little creative, you can buy a separate strap and attach it to the bag. Now that you have our selection of best tool belt for electricians, you should know what the basis was of picking those particular belts and pouches. Just make the points below your checklist and it should be good enough to guide you to your desired tool holder. Comfort: This actually depends on your task and the way of getting that done. You need to care for a lot of variables like the number of pockets, type, and shape of the bag, pads, and arrangement of tools. Materials: Take a closer look at the material used for the bag. The best materials are Dupont Cordura, nylon, leather, ballistic polyester. Arrangement of pockets: You need to see if you have enough pockets and if their sizes are correct. Depth is also a factor. Carrying mechanism: See if you are ok with the carrying mechanism. It could be handles, straps or anything. If you want belts or attachable pouches than stay alert about the width of the belt and the mechanism of the clips in the pouches. Color: Yes, color matters. You should avoid buying darker bags as it reduces the visibility. Pads and ventilation: A belt has to be well padded for maximum comfort. At the same time, it also important to have a ventilating design so that you don’t sweat while working. Additional utilities: See if they offer any additional values like a small tool carrying boxes, flashlight holders, carabineer, self-standing design etc. Q: How would I know if the separate module will fit my old belt? A: First measure your belt width. Then see if the clip or holder of the module has enough range. The seller will mention it in the description of the product. Q: How to judge the visibility? A: Visibility will be less if the color is dark. Also, care for the space of the pockets. Too deep and tight pockets lead to lesser visibility. Q: Which is better, the Velcro or the buckle? A: I think that buckles are better than Velcro. Velcro no matter how good that tends to lose its grip over time where a good quality buckle can keep going for years. Q: What tools should a tool belt hold? A: A tool belt should hold a hammer, tape measure, carabineer, ruler, nail set, chalk line, combo pry bar/nail puller, end cutter, needle nose pliers, torpedo level, scribes, pencils, utility knives, flashlight, multi-bit screwdriver. Q: Which Tool Belt is Best For Me? It can be really confusing at first but the only right answer to this question would be to go with the one that you feel most comfortable with. Now, I know this isn’t a very clear-cut answer. If I have to recommend a specific toolbelt, it will have to be the Occidental Leather 5500 Electrician’s Tool Pouch. It is a very good pouch. Also, let’s not forget about durability and safety. Your tool belt should keep you well organized and give you quicker access to your tools. There was a time when craftsmen, workers and labourers used to carry their tools in their satchels. But, there was a risk. When they were working at tall construction sites, it was quite impossible to take all the necessary tools with them. Hence, toolbelts was needed to make life much easier. We all know the hardware industry of America is a huge industry. Now a day, you can find thousands of DIY videos online all showing cool stuffs and how to make them at home. In the 1980’s where tool belt got its hype. That hype became more popular all thanks to the popular show called Tim "the Toolman" Taylor. It was the most favourite show in the 90’s. It’s the 21st century and we are not using manual tools anymore. Power tools and other handyman tools are more compact and packed with new features. It’s quite impossible to left behind any of these tools on a construction site. That’s why tool belt is getting popular each day. A tool belt is an entwined part of an electrician. Whether you are a professional or a responsible man trying to fix your own problems, there is no other way but to get the best tool belt for electricians. If you have more questions, leave us a message.